"Every superhero needs a cape, and this set comes with five, plus matching masks and slap bracelets." "Designed for kids ages two to four, it’s specially made to help them balance, with no need for training wheels." "These action figures represent superpowers such as creativity, curiosity, logic, exploration, mastery, oblivion and ingenuity." "Players can control their favorite superheroes and supervillains in this game, which features more than 100 Lego versions." "This Marvel version of Chutes & Ladders game takes a super twist on the classic board game." "Designed for kids ages 7-14, they will love to build it and will be wowed by the cool features." "Comes with four potato bodies and all the parts you need to outfit them as Captain America, The Hulk, Thor and Iron Man." "Contains a sketch pad, stencils and stickers as well as instructions to draw some of the coolest crime-fighting ladies there are and a few villains too." Every superhero needs a cape, and this set comes with five, plus matching masks and slap bracelets. Perfect for Halloween or everyday missions to save the world in the grocery store or at the local park, these three-piece costumes are sure to get tons of use. Included in the set are costumes for Batman, Spiderman, Superman, Iron Man, and the Flash. 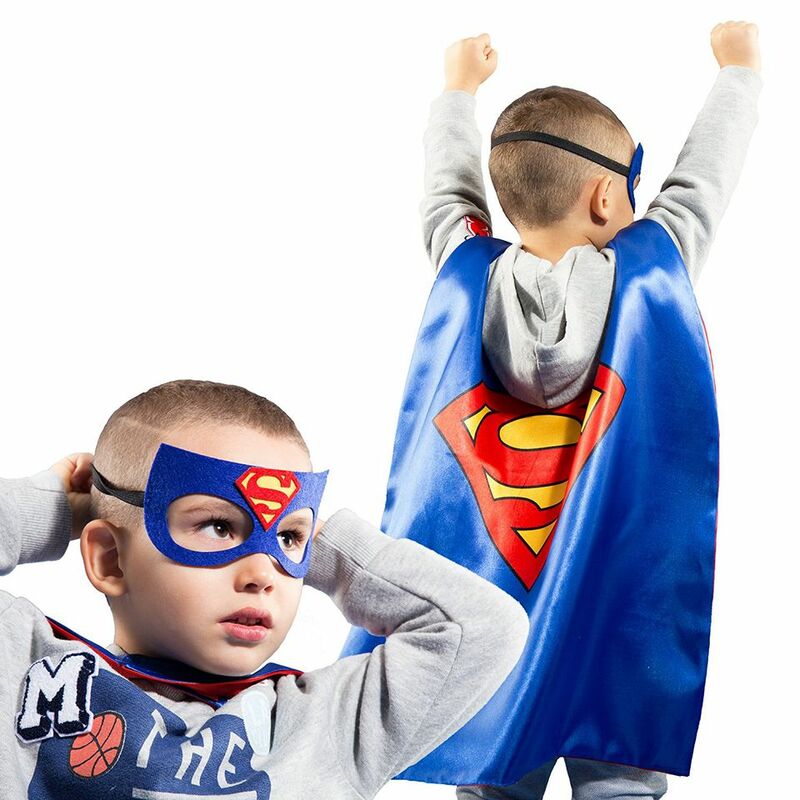 Each satin cape is adjustable with a velcro strap that’s easy for kids to fasten themselves, and one size fits most kids. Each costume also comes with a set of matching slap bracelets for even more superhero fun. 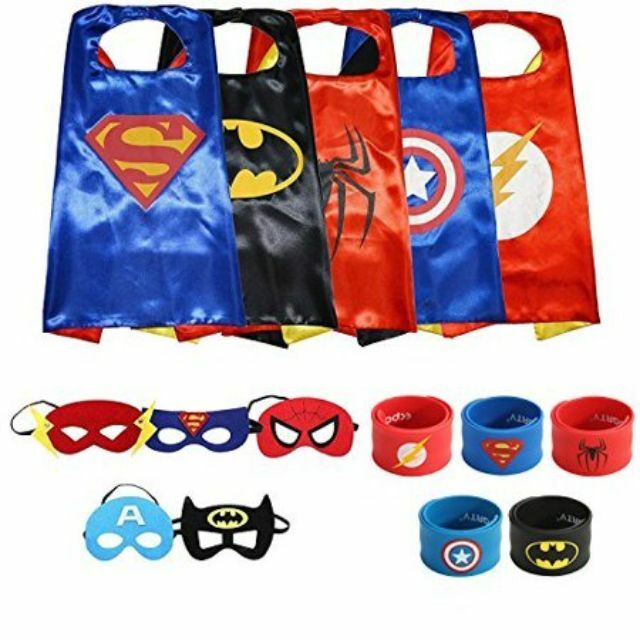 This set is a great value, and is great for play dates or parties as there are enough for a whole crew of caped crusaders. It’s sure to inspire tons of creative play and let little ones save the day over and over again. This wooden balance bike will allow them to soar around the neighborhood in super style. Designed for kids ages two to four, it’s specially made to help them balance, with no need for training wheels. Talk about a super power! There are no pedals; instead they push it with their feet, until they’re ready to transition to a bigger, pedal-powered bike. Made of bamboo, which is stronger than steel, it’s a durable yet lightweight bike that can take all of the wear and tear that goes into fighting bad guys day in and day out, and it’s environmentally friendly to boot. It does require some assembly, but all the tools you need are included, so you can get your little one on the road right away. Inspire the minds of little girls (and boys!) with this set of seven fierce action figures, who just so happen to be females. Not your traditional household names, instead these action figures represent superpowers such as creativity, curiosity, logic, exploration, mastery, oblivion and ingenuity. They each come with shields and other interchangeable accessories and a lunch box carrying case to keep it all together. Also included is a workbook to allow them to collect and share their thoughts and complete challenges as well as a rubber bracelet to which the shields attach as charms. This award-winning set is great for any child who wants to soar to greater heights. It makes a great gift for kids, but adults collectors will love them as well. For those who want to save the day on the video screen, Lego: Marvel Super Heroes Game is the way to go. Whether it’s the Hulk, Spider-Man, Black Widow, Iron Man or Deadpool, players can control their favorite superheroes and supervillains in this game, which features more than 100 Lego versions of them to swing, smash and crash through walls in their quest for good over evil. Set in a LEGO New York, they can team up to try and stop the villains from assembling a super weapon and taking over earth in the ultimate battle of good versus evil. Though this version is for the XBOX 360, the game is also made for most other platforms including Nintendo DS, PlayStation and Wii U, so you can find one that works with whatever system they have. It can be played solo or in multiplayer mode, which allows two players to try to save the world at the same time. This Marvel version of Chutes & Ladders game takes a super twist on the classic board game. Basically, the rules are the same, but the characters all change. You can choose to play as Spider-Man, White Tiger, Iron Spider, Power Man, Venom, Black Cat, Green Goblin or Rhino. Whose super power will allow them to to climb the ladders and get to the finish line first is anyone’s guess, as those chutes can be more lethal than a super villain. The suggested age range for the game is 3-15 years. While it’s typically a game for the younger set, the superhero twist makes it more appealing to older kids, and it’s a really fun game for the whole family to play together. This Lego set has a serious mission. Only Spiderman can save the day as Doc Ock has taken White Tiger prisoner in his Oct-bot. It’s Spidey to the rescue, on a surfboard no less, who will attempt free her. Designed for kids ages 7-14, they will love to build it and will be wowed by the cool features, such the six rapid shooters and detachable tentacles of Doc Ock. There’s also a police speedboat with a shooter to which Spidey can hitch his surfboard to get the job done. Five mini-figures come in this pack: Spider-Man (with a Web, of course), Dock Ock, Vulture, White Tiger and Captain Stacy -- for hours of action-packed imaginative play. Spider power! Our all-time favorite spud, Mr. Potato Head, gets the super treatment in this collectible pack. It comes with four potato bodies and all the parts you need to outfit them as Captain America, The Hulk, Thor and Iron Man from helmets and hairpieces to a cape and hammer. Talk about potato power! While these are smaller than traditional Mr. Potato Head figures (about 2 ½ inches tall), they can be used with pieces from all other Mr. Potato Head sets for extra creative creations and mashed-up fun. They’re fun for kids (recommended for ages 2 and up) to play with and build over and over, but they’re also fun for older superhero lovers to collect and display… and perhaps play with when no one’s looking. Who says superheroes can’t be fashionable? This sketch set lets little superheroes marry fashion with fighting crime for some seriously stunning girl power. It contains a sketch pad, stencils and stickers as well as instructions to draw some of the coolest crime fighting ladies there are and a few villains too: Supergirl, Batgirl, Wonder Woman, Harley Quinn, Bumblebee and Poison Ivy. Recommended for kids ages 8 and up, it’s a great way for girls and boys to get creative with their favorite characters. They can create all sorts of scenes and scenarios and even make their own comic book featuring what are sure to be the best-dressed superheroes and super-villains the world has ever seen.